Disney has revealed the first proper look at the dragon in the upcoming remake of 1977’s cult classic ‘Pete’s Dragon’ - showing the CG beastie that’ll replace the famed cartoon original. 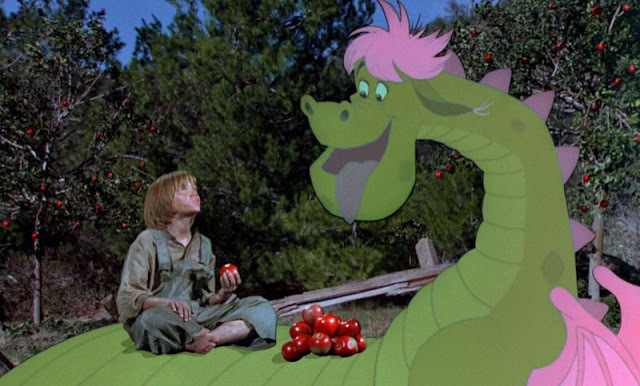 The picture was revealed by Empire and appears in their latest issue, and shows both orphan Pete and the pet dragon named Elliott he befriends. Director David Lowery told Empire Magazine: “When I went to pitch the movie to Disney, I said ‘I want him to be a furry dragon’. Pete is supposed to be cuddling up with the dragon, so let’s make him furry. The remake stars Oakes Fegley as Pete, alongside Bryce Dallas Howard, Karl Urban, Wes Bentley and Robert Redford. For comparison’s sake, we’ve included a picture of the original cartoon dragon below. The film is set for release on 12 August.